« Obama Says Bush Increasing Debt $4 Trillion In 8 Years Was Irresponsible And Unpatriotic. So Obama Increasing Debt By $6 Trillion In 3 Years Is WHAT? The number of NHS patients who have to undergo emergency readmission to hospital within a month of being discharged has increased by more than three quarters in the last decade, the Daily Telegraph can disclose. Hospitals have been accused by ministers of treating patients “like parts on a production line” after official figures suggested that hundreds of thousands of people every year are being sent home before they are well enough. More than 660,000 people were brought back to hospital last year within 28 days of leaving, statistics show, sparking allegations that patients are being “hurried through the system” so the NHS can meet waiting-list targets. The official figures show that some NHS trusts have seen their emergency readmission rate rise more than three-fold over the past decade – while some hospitals have seen only a modest increase. Last night, Andrew Lansley, the Health Secretary, said that the “hugely distressing” trend must stop. “Patients have a right to expect that when they go in for treatment that they are looked after properly and that the treatment they are given helps them to recover,” he said. The Department of Health has released detailed information on the number of emergency readmissions in every area across Britain. The figures show that 620,054 patients had to be readmitted in 2009-10 – compared to just 348,996 a decade before, a 78 percent increase. Over the past five years, there has been a 31 percent rise and a five percent increase on the previous 12 months. The data also highlights the widespread regional variations. The rate of readmission in the Kensington & Chelsea PCT area has risen by 287 percent over the past decade to 1,582 people. However, North Lincolnshire PCT has only experienced a 3.37 percent rise over the same period. Hospitals within the Hampshire PCT area readmitted 13,239 people last year. The nearby area covered by the Isle of Wight PCT only had to readmit 1,098 people. The figures, do not include patients suffering from cancer or mental health problems or maternity patients. Most of the areas with the highest increases in readmission numbers are in London and the south east, where pressure is greatest on the NHS. The Department of Health has analysed the social make-up of each area and concludes that the so-called “thriving London periphery” – the relatively wealthy commuter hinterland around the capital has suffered the biggest recent deterioration. Some of the rise in readmissions may be due to the increase in population in these areas or changes in the way that the data is collected. About 10 million people are admitted to hospital wards each year. Critics claim that government targets, such as the demand that patients be admitted to hospital for treatment within 18 weeks of seeing their GP, mean hospital managers are pressured into releasing patients early to make beds available. Earlier this month, The Daily Telegraph disclosed that the Government is moving from a system of targets for hospitals based on waiting and treatment times – to a system of so-called “outcomes” which measures the success of treatment. In a criticism of previous targets which he blames for the increase in emergency readmissions, Mr Lansley said: “Instead of focusing on the results which actually matter for patients, they focused on narrow processes to the detriment of patient care. That is why we have taken action to address these increases in emergency readmissions. Under the Government scheme, hospitals will effectively be responsible for people’s care in the weeks after they return home and will be financially penalised for discharging patients too soon. Ministers have also increased funding for so-called “tele-health” where people can “manage” their long-term conditions independently at home but are remotely monitored by doctors. The official figures have been released as NHS managers claimed that one in four people being treated in hospital should be at home – which could lead to even more re-admissions if the programme is not properly monitored. However, concerns are growing that GPs will be unable to cope with the demands of more people being treated at home. Earlier this week, it emerged that some GP practices now had up to 9,000 people registered. Yesterday, Jacqui Davis, head of the NHS Consultants’ Association, said: “Why would you want to have people isolated in their homes? This is not going to save money and it is unfortunately the wrong message. NHS managers are deliberately delaying operations as they wait for patients either to die or go private in order to save money, according to an official report. Health service trusts are “imposing pain and inconvenience” by making patients wait longer than necessary, in some cases as long as four months, the study found. Executives believe the delays mean some people will remove themselves from lists “either by dying or by paying for their own treatment” claims the report, by an independent watchdog that advises the NHS. The Co-operation and Competition Panel says the tactic is one of a number used by managers that “excessively constrain” patients’ rights to choose where to be operated upon, and damage hospitals’ ability to compete for planned surgery. It claims unfair practices are “endemic” in some areas of England and pose a “serious risk” to the Government’s drive to open up the health service to competition. But managers, who are already rationing surgery for cataracts, hips, knees and tonsils, say they must restrict treatment as the NHS is under orders to make £20 billion of efficiency savings by 2015. Since 2006, NHS patients who need routine elective care have had the right to choose between at least four hospitals including privately-run units. But there have been claims that trusts, the local bodies that pay for treatment, restrict choice and favour some hospitals to balance their books. The panel investigated whether the allegations were true. It found “many examples of PCTs excessively constraining patients’ ability to choose, and providers’ ability to offer routine elective care services”. Managers restricted GPs’ ability to refer patients to some hospitals by imposing “caps” on the number a provider would be paid to treat and by imposing minimum waiting times, its report said. Under government targets, patients should be treated within 18 weeks of referral by a GP. But even when surgeons could see them far sooner, the study found that some trusts made hospitals wait as long as 15 weeks before operating. The tactic forced private hospitals, which were more likely to be able to treat patients quickly, to operate as slowly as overcrowded NHS units in an “unfortunate levelling down”. It said that minimum waiting times should only be used as a “last resort” and told trusts to publish their policies on the home page of their websites. The panel also found that trusts tended to give elective business to their local NHS hospital, rather than allowing choice, in order to ensure its other services such as casualty departments remained financially viable. The findings come as the NHS is under pressure from increasing demand and tighter budgets. Waiting times have lengthened since last year’s general election and more trusts are increasing the number of procedures of “low clinical value” they turn down or insisting that patients’ conditions worsen before they are seen. Labour yesterday unearthed Treasury figures that show health spending totalled £101.985 billion in 2010-11, down from £102.751 billion in the last year of Labour, despite David Cameron’s pledge that “the money going into the NHS will actually increase in real terms”. The Tories pointed out that the fall represented the last part of the previous government’s five-year spending plan. Ministers welcomed the competition panel’s study. Paul Burstow, the care services minister, said: “This report illustrates exactly why we need to modernise the NHS and increase choice for patients. Under the Health and Social Care Bill, which has been watered down in the face of opposition from the medical profession and Liberal Democrats, power to buy treatment will be handed from trusts to new bodies led by GPs. When you see NHS (or “National Health Service), just think “ObamaCare for England.” And then think about the hell that you voted for your parents to experience in voting for Obama. The beast is coming – that is, if you’re still healthy enough after ObamaCare gets its fangs into you that you’re still alive to suffer under his tyranny. 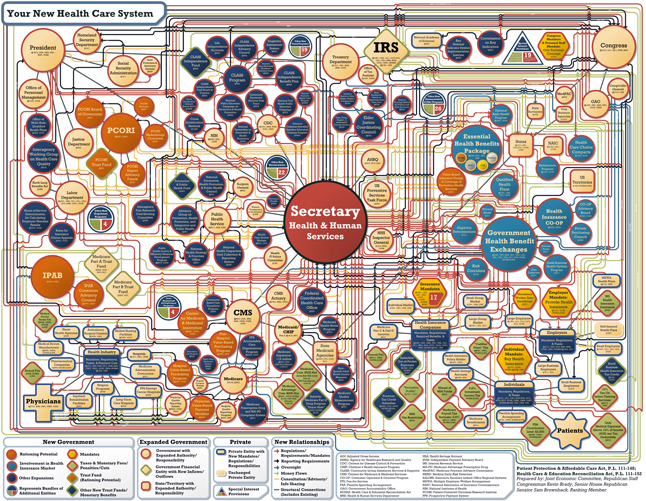 This entry was posted on December 30, 2011 at 6:00 am and is filed under health care. You can follow any responses to this entry through the RSS 2.0 feed. You can skip to the end and leave a response. Pinging is currently not allowed.